In a desperate attempt to take back the passenger business from the airlines. 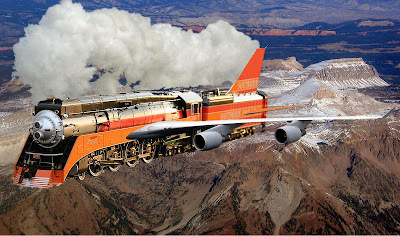 The Southern Pacific Railroad announced yesterday the creation of a new corporate Branch "Southern Pacific Airlines". With nonstop flights to "any airport that has oil and a watertank". 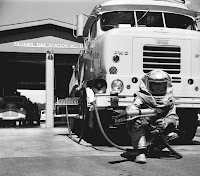 Passenger service will begin "as soon as they figure out how to pull the passenger cars"
The Terminator Model 33 1/3 is sent back in time to the year 1967, in a vain attempt to change the future, and stop the giant child who will grow up to mock it, by photoshopping it into funny pictures. 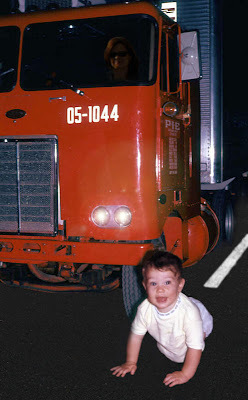 Here it's image was captured as it tries to run down the helpless child with a semi truck at night. Why the giant child was crawling in the street is unclear. When asked, his parents said "You try to stop him", "He's Huge!". In January of 2007 my dad came to visit us. It had been a couple of years since he was last down here. He had some vacation time he needed to get rid of, since I could not take time off of work, and we had spent our vacation money getting rid of a dead pine tree (that's another story) he came down here. One of the first things we did was visit his sister Betty, and her husband Russ at their home in Mesa. Betty is Bob's oldest Sister, his other Sister Helen passed away in January of 1976. Betty and Russ have a son named Mark. On the morning of the 25th As luck would have it Mike's Son Sean was born, and Bob was (if I remember correctly) the first Grandparent to hold him. Before we went down to see his spawn and since both mother and child were still recovering we stopped by Historic Station 8 to speak with the firemen who worked them, as Bob had recently donated the last of his fire pictures to them (through me). Historic Station 8 is located on 7th ave. and Encanto, it is open to the public and is often used by the fire department to have going away parties for retiree's. It does have some interesting equipment like this resuscitation kit and the breathing apparatus in the picture below, The breathing apparatus is exactly like one I used to own (which was thrown away by a certain unnamed aunt). We also stopped by a couple of fire stations and former fire chief Brunacini's house (just took pictures). Here are a couple of pictures of Sean with Dad, Sean with Grandad, and Sean with Kathi. A couple of days later we went to the Arizona railway museum as shown in "A Very Good Day", and stopped by Mike's apartment where one of his cats took great interest in Bob's shoes. As his trip coincided with his Birthday we had a small party at his sisters house where she served us enormous portions of a very sweet cake. 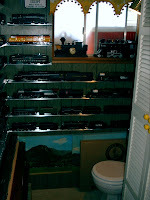 The day before he left we took more pictures of fire trucks, visited a customer of his who has a standard gauge layout in his garage, and who raises Abyssinian Cats. A comedy of Errors in three days. A couple of years ago my mother in-law (Carol) started feeding stray and feral cats in her neighborhood. She has 5 cats that live in the house and 15 or more that live around the house. Since she has cancer and is going through Chemo and radiation therapy her immune system is not up to par. She also is not able to feed the cats anymore. since 5 of the cats are kittens and 6 or more of them are sick we have to get rid of them. Maricopa County Animal Control (dog pound) considers feral cats to be wild animals (not under their jurisdiction) and will not come out and capture them. The Arizona Humane Society wants $20.00 for the first feral cat brought in and $75.00 for each additional cat. MCAC wants $96.00 per cat that is turned in. It is against the law to shoot or poison them. So we started gathering them up. The kittens were easy to catch (one was almost dead). We caught 1 mother cat by chasing it in to Carol's laundry room. I finally grabbed it by the neck and put it in the cage with the kittens, for my troubles I got dusted with fleas (didn't find out till later), and scratched. We then got in the car to go home and get ready to take them to the AHS, that is when I found out I had the fleas on me. I brushed off as many as I could and when I got home I stripped to my underwear in the backyard (yes I did). we left my clothes outside to bake in the sun and later I washed them in bleach. I took a shower and we went back with my truck to pickup the cats (didn't want anymore fleas in our cars). To cut it short the kittens and mother cat will be put down as they all have upper respiratory infections and very likely Feline AIDS (the sick one died on the way to the AHS). On our way home we stopped at Pratt's feed store and picked up an animal trap. We went back to set the trap. In the Afternoon we checked on it and caught a big mean black cat. We then reset the trap. Later that day we picked up some flea collars for the inside cats. putting them on her 2 house cats Charlie and Simba, and the 1 feral cat (who's name is feral) was no problem. However..... The 2 remaining cats are completely wild, I chased the female all over the house and finally in to Jeff's closet and wrapped her with a towel so I could put the collar on. The male was another story after chasing him all over house I cornered him in the second bathroom where he proceeded to literally climb the walls (he almost made it to the ceiling twice). I finally grabbed him in a towel and held him down in the family room where he promptly bit me (and it hurt). He did not get a collar and he's lucky I didn't kill him. As you may imagine I was concerned about rabies. 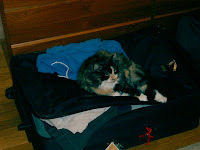 However the cat had it's shots (including rabies) in December 2006. I did look up rabies and cat scratch fever but could not find anything useful other than if you are bit by a cat you must see a doctor immediately. So off to the emergency room at Banner Good Samaritan (part of the Banner family of hospitals). 5 hours later they gave me some antibiotics and a Tetanus shot (and it hurt) (queue ominous music). On the way home we drove by Carol's and noted we had caught another cat (this one was small and gray (the last of the kittens). The next morning (there's that music again) we went back to take the cats in (we hadn't caught anymore). Once again we reset the trap. By this time Winston had come around. Winston is a very friendly stray cat. But Carol already had 3 to many cats so we picked him up and put him in a rabbit cage with food water and a litter box (ominous music continues). Winston will go up for adoption if he is found to be disease free. The other cats would be put down. luckily the AHS didn't enforce their payment rules so at this time it had only cost Carol $160.00 dollars. We checked the trap a couple of times that day but caught nothing even thought 2 cats were hanging around (music gets louder). Around 3pm I started to feel like crap (music crescendo) around 7pm I really felt like crap and I am running a temperature of 100.7 (music finale). So off to the emergency room again. So they take my blood pressure and the machine is having trouble getting a reading, in fact on it's second attempt I ripped it off my arm because it was so painful. At this time Kathi's looking at me and says that I am bright pink. The triage nurse had to take my blood pressure from my leg, the whole time accusing me of having high blood pressure (I do not). When she finally got a reading it was 205/110 and my pulse was 120. Gee... somethings wrong with me. When I see the doctor all they do is give me more antibiotics pat me on the head and send me home (another 5 hours at the hospital). Next morning besides being tired from staying up till 2am I feel even worse I can barely move, my arm feels like it was hit by a baseball bat, I force myself up, eat breakfast, let my boss know I won't be in, after an hour I give up and go back to bed. I wake up at noon once again force myself up take a shower and pretend I don't feel terrible. I start looking into the possibility that the tetanus shot is to blame. I start doing searches on the internet, hey!!! what do you know lots and lots of people report the same exact thing I did. In one case a lady was unable to work for several years and spent lots of time and effort attempting to get compensation. So at 2pm I call Kathi and at 3pm it's back to the Emergency room (again). I am there for an hour and they decide to "fast track" me I am sent back to a waiting room where I will be triaged by a doctor (so they tell me). 3 hours later (remember "fast track") I am seen by a physicians assistant. I ask one of the people if I might be having a reaction to the vaccine? "Oh no no no, That doesn't happen". They take a gallon of my blood (from each hand) which involves 3 people trying to find a vein (one girl gets pissed when she can't find the vein), and send me to another waiting area. one hour later they X-ray my hand and Chest (who knows why). I return to the waiting area and am quickly told to go wait in the main waiting room. I wait in the main waiting room for 3 hours. Intermittently some woman sits next to me ( I'm in one of the few 2 person chairs available) and proceeds to shake like a small earthquake. This goes on for a while before she decides she doesn't like sitting next to me. I called Kathi to come get me as I thought I was almost done (ha ha ha ha ha ha ha ha ha ha wipes tear from eye). She waited for an hour but had to leave to take care of some stuff. 1 hour later they give me my results..... Wait for it..... A little longer.... Now! "Mr. Guildig your results are negative" "You probably caught a virus" (yeah from the vaccine). "We are going to give you 2 liters of saline". "Please put on this gown, the doctor will see you in a few minutes to make you uncomfortable" (actual quotes). So 2 hours later (total of 9) I was pumped full of ice cold saline. One can only imagine how many times I had to piss last night. This morning I felt well enough to go to work. We caught another cat and took it in to the AHS. Total so far $180.00 and one bag of cat food (donated). 2 more cats to go. No animals were harmed (by me) during the making of this post (though I really wanted to). Update 6-14-07 We caught the female calico and turned her in today, 1 more to go. Update 6-17-07 The last female feral cat was caught and turned in today. Finally! Back in 2002 Kathi and I drove to Seattle to visit my Dad (1500 miles in 3 days). One of the places we visited was the Last Resort Fire Department. 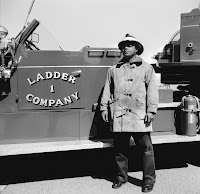 The LRFD is run by Galen a retired Seattle fireman. Galen is very "meticulous". As you can see from these pictures The building where he keeps his fire apparatus holds (I believe) 12 fire trucks. Including one out front, and one hanging from the ceiling. Everything in the LRFD is place with Meticulous care and all space is used. We stayed at a friend of Bob's house. They were out of town so we house sat. They had a cat named Mija. Mija liked to wake us up in the morning by standing on us and using us as a scratching post. But we liked Mija. We saw the Fremont Troll under the bridge. Click on the picture below for a panoramic view of Lake Washington taken from above the I-90 Tunnel. Yes the bridge is floating on the lake. We also visited Jurassic Park. Jurassic park was a large piece of property owned by a lawyer friend of Bob's. It was called Jurassic park because it was green, overgrown and there were a lot of unusual animals there. It is no longer there, several month after we visited the animals were moved and the property sold. So without further ado here is a short clip from our visit there. The loud chirping noise is an alarm call made by the deer. We did some other things I don't have any decent pictures of, we did some antiquing, and drove up into the cascade mountains. 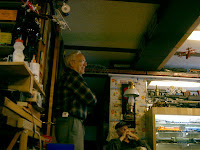 A couple of days later we visited another friend of Bob's this guy used to be an insurance salesman (I think) he had model trains all over his his basement and garage. 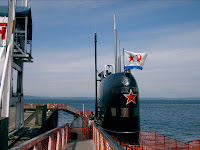 We went on a tour of a Russian Foxtrot-Class Cobra sub that I believe is still in Seattle. Here some video of it. 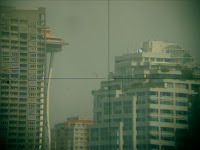 I took a picture through the periscope. All this wore my dad out. We did some other things but these were the more interesting highlights. Kathi and I then drove home again (well mostly I drove) this time 1500 miles in 2 days. Man was I tired. Oh yeah for those who don't know when you drive through Oregon it is against the law to pump your own gas. It seems that 1. The old people want it that way and 2. they do it to keeps the freaky people employed. They stack Ship that High? Pieces of eight... No wait? FIGHT! so we can run. Who WILL be the next Davy Jones? Wow I'll say that again WOW. I guess when you have to "out do" your two previous movies this is how you do it. I mean come on really. Strap yourselves in for this one. Spectacular special effects, more fighting and battles than you can shake a stick at, lots of gratuitous gross out stuff, and tons of plot twists. A good way to Confuse-a-Cat. Anyways go see it!